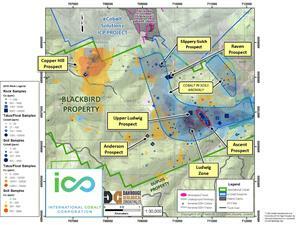 VANCOUVER, British Columbia, Oct. 10, 2018 — International Cobalt Corp. (CSE: CO), the “Company” or “International Cobalt”) is pleased to announce that it has received and compiled the results of all soil and rock samples from the property-wide program recently completed on the Company’s 100-percent owned Blackbird Creek Project (the “Property”). 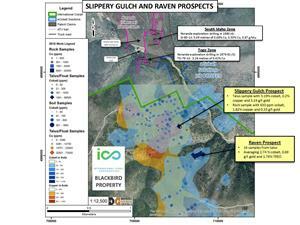 The summer soil sampling work has been exceptionally successful in defining an exploration corridor trending south from the historical Blackbird mining camp. Crews completed a systematic sampling program resulting in 2015 soil samples and 293 rock chip samples taken from the Property. 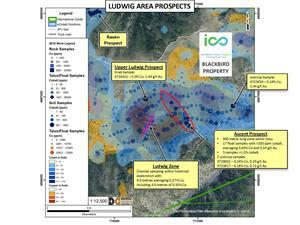 The detailed rock sampling and mapping has advanced historically known prospects and discovered new mineralized zones. 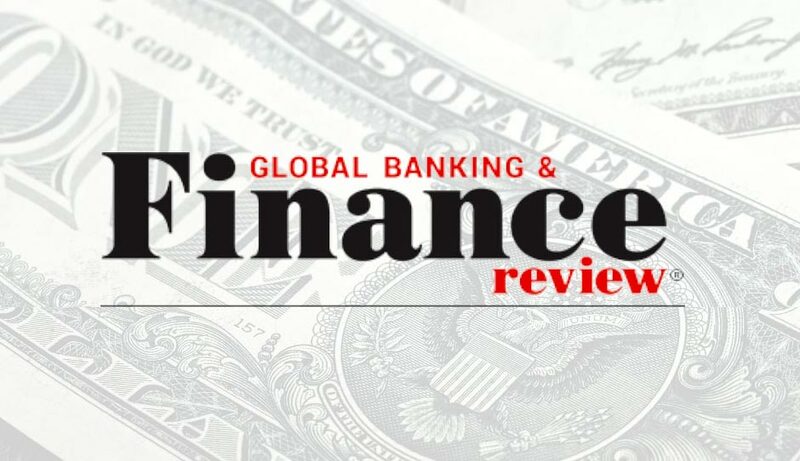 The program has allowed the Company to identify four distinct prospects for follow up within the Property boundary. As previously reported (Sept 27, 2018) sixteen samples returning high grades over one per cent (1%) Co and a high of 5.88% Co, and consistent gold values of up to 1.8 g/t Au. In addition, the samples were tested for all Rare Earth Elements (REE) based on the anomalous lanthanum concentrations. The Samples returned an average 1.75% Total Rare Earth Oxide (TREO*), with a high of 3.80% TREO. See Figure 2 below. The Ascent prospect confirms the historical samples that were sampled by Noranda, previously released by the Company (March 8, 2018). Seventeen boulder samples from the prospect average 0.65% Co and 0.34 g/t Au, with a high of 3.62% Co and 1.73% Au. See Figure 3 below. Channel sampling was conducted within the historical exploration adit at Ludwig. A continuous 9.0 meter channel sample returned an average of 0.27% Co including 4.0 metres of 0.53% Co. See figure 3 below. 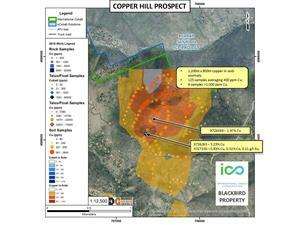 Soil sampling has defined a large 1200 metre by 800 metre copper anomaly averaging 400 ppm Cu from 125 samples. Individual rock chip samples include 1.47% Cu; 3.25% Cu; and 0.83% Cu, 0.32% Co, 0.21 g/t Au. See figure 4 below. NI 43-101 DISCLOSURE Neil McCallum, PGeol., Dahrouge Geological Consulting Ltd., a qualified person as defined by National Instrument 43-101, supervised the preparation of the technical information in this news release. All rock samples from the program were sent to ALS Global in Reno, Nevada. Rock samples were prepared according to ALS protocol Prep-31 and analyzed for 33 elements by four acid digestion followed by ICP-AES according to ALS code ME-ICP6, over-detection limit analysis for cobalt and copper was provided by code OG62. Gold was tested according to code Au-ICP22 method of standard fire assay with an ICP-Atomic emission spectrometry finish on a 30 or 50gm aliquot, which has a detection range of 0.001 to 10 g/t. Soil samples were prepared under ALS protocol PREP-41 and analyzed for 51 elements by partial Aqua-Regia acid digestion followed by ICP-AES (ALS protocol ME-MS41). *Total Rare Earth Oxides (“TREO”) include: La2O3, Ce2O3, Pr2O3, Nd2O3, Sm2O3, Eu2O3, Gd2O3, Tb2O3, Dy2O3, Ho2O3, Er2O3, Tm2O3, Yb2O3, Lu2O3 and Y2O3.